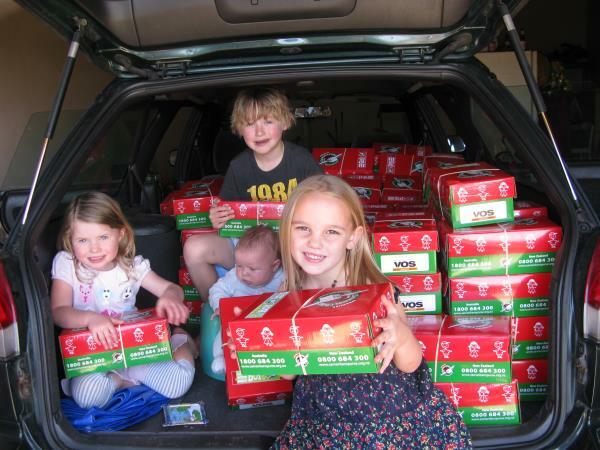 Hayley Blackwell, Eliza Payne, Willis and Harvey Jensen with the Christmas packages. CHRISTMAS may still be a months away but that doesn’t mean Santa’s Little Helpers aren’t already out and about. Operation Christmas Child is a worldwide project of Samaritans’ Purse which aims to bring joy and hope to children in desperate situations. Through the power of a simple gift, children caught in the midst of war, famine, natural disaster and extreme poverty can be shown they have not been forgotten. Hastings Council, businesses and service groups such as Rotary and Quota, plus many who responded from the community in general. In this program shoe boxes are filled by individuals from wealthy nations for children in developing nations. Six types of items are placed in the boxes. They are, something to wear, something for school, something for personal hygiene, something to love, something to play with, and something special. Boxes from Australia go to Vietnam, Cambodia, Papua New Guinea, Fiji and Samoa. For further information contact Susan West on 6584 5566 or 0414 338 541 or by asking at the Anglican Church office in Hay Street, Port Macquarie. Boxes will be collected at the Baptist Church on Friday 19 and Saturday 20 of September.